Written by Maja Zupanc and Anže Zupanc. A single glance at Earth from space reveals water is the life force on our pale blue dot. With over three quarters of water covering the planet and 70% of human body consisting of water, this wonder liquid permeates both land and body, making it an essential substance both for the development and nourishment of life and the sustenance of the environment. For human needs — apart from our dependence on it for survival — water also lies at the heart of economic and social development. In times of abundance, water enables economic growth, which in turn reduces poverty, and in times of scarcity, it can cause life-threatening crises. This has become startlingly apparent with Cape Town’s water shortage. Time-lapse satellite images providing a transparent image of the Theewaterskloof Dam’s depletion. Created in EO Browser! As water is expected to become increasingly scarce in the future, governments will need all the help they can get understanding their water challenges, predicting risks, and tackling any existing water problems. Implementing ground-based water monitoring and measuring networks is costly and due to networks deterioration in some cases also unreliable. Developing countries in particular need affordable, yet reliable solutions and tools for monitoring available water resources. The goal of the BlueDot is to monitor the water levels of over ten thousand water bodies in near real time across the planet. 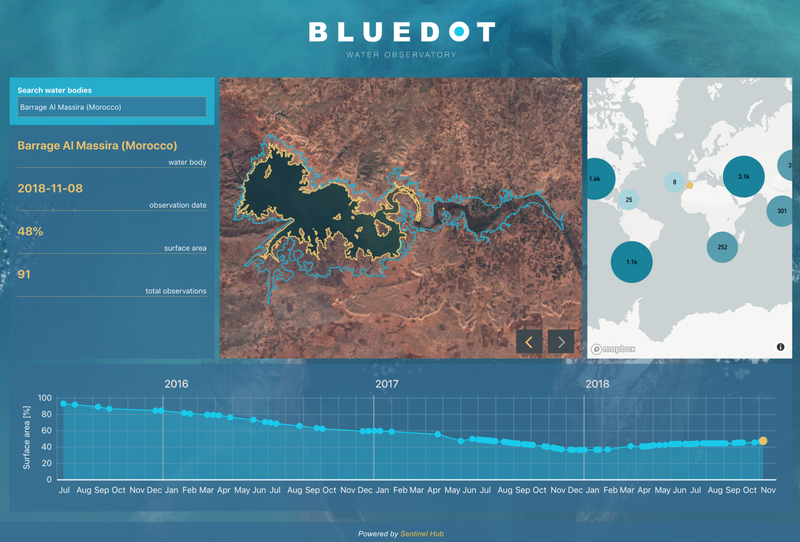 All observations are provided and can be explored interactively through the BlueDot Water Observatory Dashboard. More than 7,000 water bodies are currently already available. New data are constantly being added according to the water risk ranking map from the Aqueduct project provided by World Resources Institute. We developed BlueDot service based on available research in Earth Observation (EO), which is unfortunately still not exploited efficiently. Our solution builds on top and is complementary to previous projects like Global Surface Water Explorer (by the European Commission’s Joint Research Centre and Google) and demonstrates the possibility of building an efficient global EO service, freely available and practically fitting into your laptop. Who can Benefit from the Water Observatory and How? The BlueDot Water Observatory provides a valuable service to local authorities, governmental agencies, natural parks and reserves, agricultural ministries and agencies, stakeholders in food production, and citizens alike. They can use the data provided by the Water Monitor through the RESTful API as an important input in their decision-making process, planning, or simply to display water levels of water resources of their interest on-line. Although the BlueDot provides useful information and easy-to-use services on its own, it can also serve as a starting point, a reference, around which a larger, predictive analytics-oriented business focused on exploitation of satellite imagery can be built. In 2016, Marocco was hit by the worst drought in three decades. Their second-largest dam, Al Massira, shrunk by more than 60 percent over the last three years. Left: Time-lapse created in EO Browser includes the images from 2015 to 2018. Right: The data from BlueDot application are clearly showing slow rise of the water levels since January 2018. Satellite imagery is acquired using sentinelhub Python package, which uses Sentinel Hub services. Cloud masking is performed using s2cloudless Python package developed by Sinergise. The list of monitored water bodies is based on GWSP’s Global Reservoir and Dam (GRanDv1.01) database, and WWF’s Global Lakes and Wetlands Database (levels 1 and 2). The polygons outlining the nominal water extent of majority of water bodies in our database have been replaced with data from OpenStreetMap. We used simplified feature maps prepared by Geofabrik. The database of water bodies is available for download. The shape files of water areas from OpenStreetMap are visualized in blue. The BlueDot Water Observatory application provides the shape files of the current state of the water body based on cover classification, which are visualized in orange. Image shows the Folsom Lake, U.S. on November 6, 2018. Vector data manipulation is done using geopandas and shapely Python packages. Vectorisation of detected water extent is done using rasterio Python package. Current water levels are displayed in map using mapbox GL and the dashboard displaying the historic data (time-series) results has been developed in-house. The water levels of the Folsom Lake, U.S. from January 2016 up to date (inspect the data in the BlueDot Water Observatory). BlueDot technology is an open-source, so that anyone can use it and build a similar service for other use cases as well. The technical description will follow in the future, but for those interested you can find current version of the source code, not cleaned one, on our Github: open-sourced code for water detection algorithm and front-end dashboard. There are more than half a million reservoirs in the world that are at least one hectare in surface area. Many are gradually shrinking, not really known to the people who rely on them. In order to provide a stable water supply there is clearly a need for a real-time global water resources monitoring system. 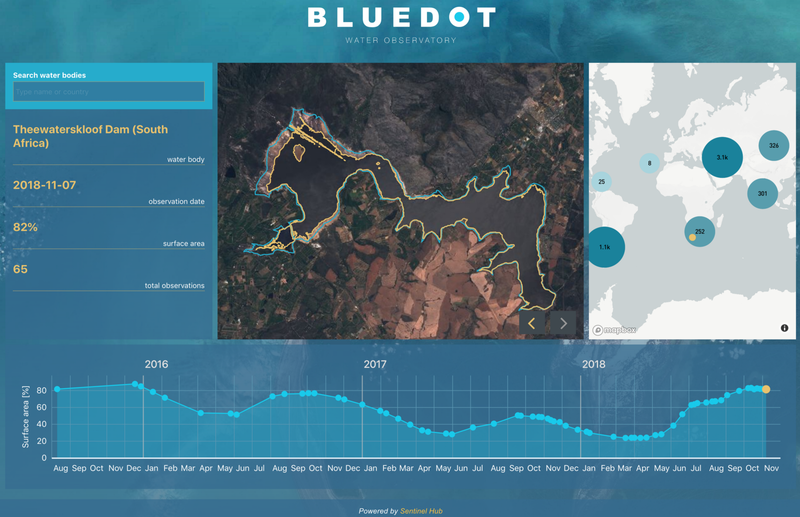 We believe that the BlueDot Water Observatory will take an important role in providing a relevant data base of water bodies combined with the full archive of satellite imagery up to date. Find more information about the BlueDot project on the official page and freely explore all currently available data through the Dashboard. If you have any questions, suggestions or feedback, write to us via email info@blue-dot-observatory.com or Twitter!